Bonswa from Port-Au-Prince! Tuesday was a great day in clinic. The team worked as a wel- oiled machine with a day’s experience under our belts. In fact, we were efficient enough that we finished early and wished we had requested a few more patients for the day. At the end of clinic each evening, our lead translator asks how many patients our team would like to see the next day. Patients walk to clinic in the early morning hours, lining up as early as 5:00am. The clinic then gives out tickets for visits for the day. When 125 tickets (or whatever number we choose) have been given out, the line is cut off. Patients then wait outside the clinic in the hot Haitian sun until their turn to be seen. The system works well, and there’s no need to cut off the line while there are still people waiting. But, it can be challenging to estimate how many patients we can adequately care for in a given day since the type and acuity of illness is so variable. Our devotion on Sunday evening before the start of clinic centered around Matthew 22:35-40 – the commandments to love the Lord our God and to love our neighbor. I have been thinking this week about how broadly we can define “neighbor.” I feel privileged to serve with my neighbors from WPC and those from Topsail, NC and Rochester, NY. I feel privileged to serve with our neighbors who are our translators, many of whom worked with us last year and greeted us with warm smiles and big hugs. 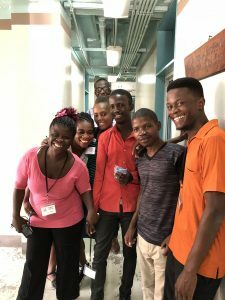 I feel privileged to serve our Haitian patients, who face so many challenges and live in such a different world than me, but who laugh at the same jokes, who cry when their children are in pain, and who are comforted by a doctor’s reassurance and a nurse’s care. We look forward to another busy day tomorrow. Please keep us and the people of Cité Soleil in your prayers. Fun in DC Central Kitchen!